Pennsylvanians seeking relief from the substantial burdens of a criminal record may soon be eligible to petition the court for an order of “limited access”. An order of limited access (i.e. record sealing) provides those with certain misdemeanor convictions the ability to obtain employment and housing without facing the discrimination that can accompany a criminal record. How Will My Options Change Under the New Law? The new record sealing statute will extend the opportunity to move past the stigma of having a criminal record to those who have been law-abiding citizens for at least 10 years. The eligible offenses will be nonviolent misdemeanors–second and third degree misdemeanors (notated as M2 and M3) and ungraded offenses. These options were formerly available only to a very small population of ex-offenders (individuals convicted of summary offenses, those 70 years or older and those who have been deceased for 3 years). The new law will take effect November 14, 2016, making it possible to effectively seal your record from being viewed by an employer or landlord in the event they obtain a background check. Petitions for orders of limited access, or record sealing, under Pennsylvania law 18 Pa. C.S. § 9122.1 may then be submitted to the courts for their consideration. Am I Eligible For Record Sealing? In November 2016, the courts will likely receive a large increase in the number of individuals filing these petitions. Therefore, delays in processing by the court and District Attorney’s office are to be expected. If eligible, we recommend having your petition prepared and ready to file as soon as possible. The petition must be filed in the Court of Common Pleas of the county in which the conviction occurred. Case documents are often required to ensure the accuracy of the information contained in the petition. A copy of your Pennsylvania Police criminal history report must also be included when filing. There is a filing fee of at least $132, but it may be more depending on the county or court. Sometimes there are fee waivers for those with limited resources. The District Attorney’s office is then given 30 days to object to or approve the petition. If approved, the order will be granted and your record sealed. If the District Attorney’s Office objects, the court will set a hearing date before a judge at which the case will be argued. The District Attorney will present their objections and you or your attorney will have the chance to respond. It is often possible for your attorney to attend the hearing in your place, which can be helpful if you do not live near where you were convicted. If your case is granted, law enforcement agencies will only be able to share information from your record amongst themselves, with courts (in the event of another arrest, it can be used for sentencing and bail determination) and with some governmental agencies (for licensing purposes, described in section 9121(b.1) and 9124(a). They will be prohibited from sharing any of the information with the public, including through a background or credit check. It is important to note that approval of these petitions is not guaranteed. The court is not legally required to approve and may consider them on a case-by-case basis. Seeking help from legal professionals will likely increase your chances of obtaining a sealed record. A bill that expands the law to provide for expungement of certain misdemeanor convictions in Pennsylvania was recently re-introduced in the State Senate. 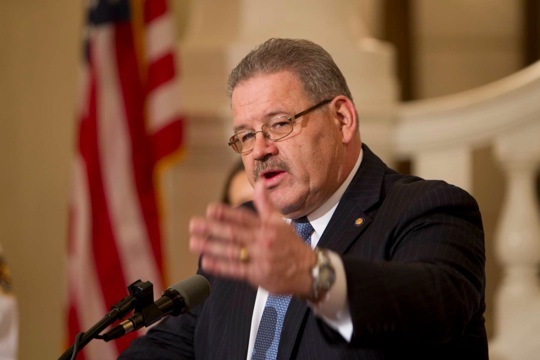 On January 15, 2015, State Senator Stewart Greenleaf introduced Senate Bill 166, which would greatly expand the expungement law in Pennsylvania and provide former offenders a deserved second chance. The recently introduced SB 166 provides for the same changes to Pennsylvania’s expungement law as Senate Bill 391. 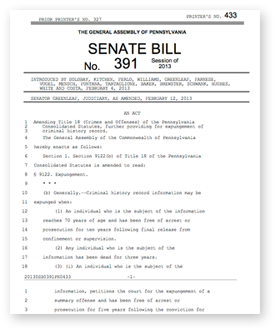 In October of 2013, the PA State Senate unanimously passed Senate Bill 391. Following passage in the senate, SB 391 was sent to the PA House for consideration but was never brought up for a vote. Under the proposed changes, the new law would allow certain offenders with misdemeanor convictions to expunge their conviction after a waiting period has been satisfied. Pennsylvania’s current law does not allow individuals with misdemeanor or felony convictions to expunge their record, no matter what amount of time has passed, until he or she is over seventy years of age and has not been convicted of any offense for five years or until the person has been dead for three years. SB 166 would allow individuals who have nonviolent second or third degree misdemeanors to petition to have their criminal records expunged if they have not reoffended in seven years for second degree misdemeanors or ten years for third degree misdemeanors. If Senate Bill 166 is passed and enacted, Pennsylvania would join a growing number of states that have added or improved their expungement laws in recent years to reduce the number of years that a criminal record can prejudice an individual. This national trend evidences the importance of allowing former offenders, especially those with low-level offenses, the chance to move forward without the stigma that comes with a conviction. On February 3, after receiving a unanimous vote in the Judiciary Committee on January 22, Senate Bill 166 was referred to the senate Appropriations committee for consideration. We will continue to post updates as this extremely beneficial bill is considered by Pennsylvania’s legislature. After being approved in a unanimous vote by the Pennsylvania State Senate in October, Senate Bill 391, the expungement bill sponsored by Senator Timothy Solobay (D – 46) is waiting for action in the House Committee on the Judiciary. Supporters of the bill say that Committee Chairman Ronald Marisco (R -105) may allow for a vote on the bill in February. Chairman Marisco has strong law-enforcement connections and a solid anti-crime voting record, so he may be having an knee-jerk reaction to this bill. Hopefully, he will see that the bill is supported by the state’s district attorneys and that other red states have passed laws that expanded expungement. SB 391 will expand the Pennsylvania courts ability to expunge criminal records to include low level misdemeanors after waiting periods have been met. Under current law, no misdemeanor convictions are eligible to be expunged. Please contact representative Marisco and ask him to allow a vote on SB 391. He can be reached via email at [email protected] or you can call his office at 717-783-2014. Monday, June 24 – Harrisburg, PA. 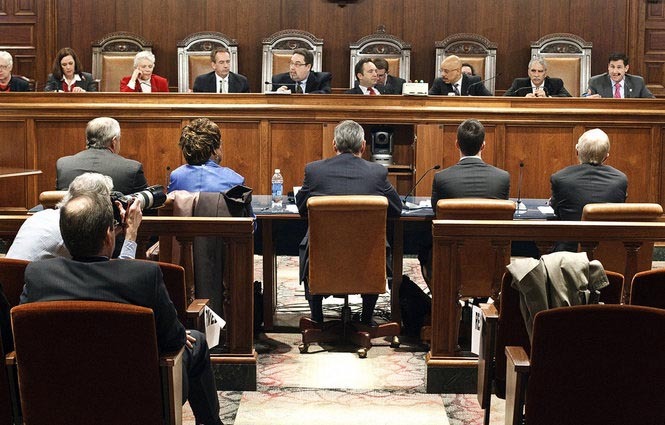 The bill proposing to greatly expand Pennsylvania’s expungement law, Senate Bill 391, was moved up on the Senate calendar today. Representatives from Senator Tim Solobay’s office said they are optimistic about the full Senate vote happening this week. Senate Bill 391 was unanimously approved by the Senate Appropriations Committee on June 17, 2013, and has since been awaiting a vote by the full Senate. Senate Bill 391, which is sponsored by Senator Solobay, modernizes Pennyslvania’s expungement law by allowing some offenders with low-level misdemeanors to expunge their record after they have proven that they are rehabilitated and satisfied a substantial waiting period. If Pennsylvania enacts this legislation, they will join seventeen other states that have expanded their expungement laws in the past five years. Please contact your state Senator and let them know you support SB 391. Monday, June 17 – Harrisburg, PA. The Senate Appropriations Committee unanimously approved Senate Bill 391 today. The bill, which is sponsored by Senator Tim Solobay, will expand the eligibility for expungement of criminal records to include some low-level misdemeanors. The next step for the bill is a vote by the full Senate on the senate floor. Mathew Higbee, an attorney and former political consultant who tracks expungement bills nationwide, says that he would expect that the bill will be supported by the full Senate. “It is rare for a bill to be rejected in a full floor vote after it gets unanimous support by a bi-partisan committee,” said Higbee. The Senate Appropriations Committee is schedule a vote on SB 391 for Monday, June 17, 2013. The committee is composed of 15 Republicans and 9 Democrats. Senator Jake Corman is the chair. A complete list of committee members can be found here: http://www.legis.state.pa.us/cfdocs/CteeInfo/index.cfm?Code=3&CteeBody=S. The committee must pass the bill in order for the full Senate to have an opportunity to vote on the bill. SB 391 modernizes Pennyslvania’s expungement law by letting low-level offenders to expunge their record after they have proven that they are rehabilitated and met substantial waiting periods. Seventeen states have expanded their expungement laws in the past five years. Expungement expansion has been supported by Republican and Democrat state legislatures. Please contact your representative and let them know you support SB 391. At a time when the federal government is spending billions of dollars bailing out banks, manufacturers and foreign governments, Pennsylvania should take the opportunity to give thousands of Pennsylvanians a second chance by modernizing the way it treats criminal records. State Sen. Tim Solobay, D-Canonsburg, has introduced Senate Bill 391 to do just that. The process by which people can apply to a court to have a criminal record removed from public view, called expungement, is currently not available to people convicted of even the lowest level of misdemeanors. This leaves tens of thousands of people branded for life as criminals in Pennsylvania. If SB 391 is enacted, Pennsylvania will join a growing list of states that have modernized their laws to reduce the period during which the consequences of a criminal record can continue to prejudice people convicted of low-level offenses. The bill won unanimous support in committee on Sept. 27, and Sen. Solobay said he is hoping the bill will soon win approval from the full Senate. Senate Bill 391 would allow those convicted of certain misdemeanors of the second and third degree to apply to have the record expunged if they keep a clean record for seven years and 10 years, respectively. State Sen. Tim Solobay has reintroduced legislation intended to curb prison costs and lower recidivism rates by clearing minor criminal records so that former offenders can find employment. Senate Bill 391 would allow individuals who were convicted of certain misdemeanors of the second and third degree to apply to have the record expunged if they keep a clean record for seven years and 10 years, respectively.